The Disabled in Development (DiD) Project is seeking out disabled, chronically ill, and aging nonprofit development and philanthropic professionals already in the field – some for decades – for their constructive advice on how to put inclusion principles into practice. DiD is our place to document advances in inclusion and to testify to ableism’s structural barriers that we encounter and that all-too often halts our career advancement or forces us out. Our stories are important. I’ve had to learn how to be a disability rights activist over the past 25 years in order to meet my responsibilities as a fundraiser. Even though I worked for great nonprofits and was mentored by women of color and LGBTQ allies, disability identity and disability rights were often invisible/marginalized in my work spaces until 2011 when I came to Disability Rights Education and Defense Fund (DREDF). Before that, only Legal Aid at Work had had a disability rights lens. Right Now: The work I do now is informed by 25 years of fundraising and management experience in grassroots or small community-based nonprofits in the Bay Area. 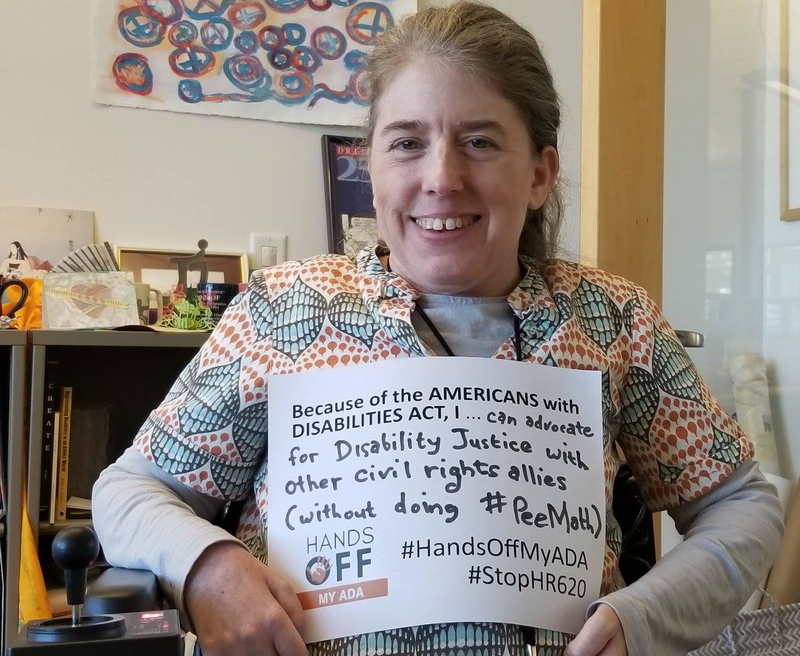 I’m in my eighth year as the Director of Development for Disability Rights Education and Defense Fund (DREDF), the national cross-disability legal and policy center founded and led as a partnership of disabled advocates and family members of disabled people. In 2018, I became a Trustee of the Awesome Foundation Disability Chapter, a micro-grantmaker led and funded by disabled activists that centers disability work. I am now launching the Disabled in Development Project™(DiD), a stigma-busting, story-telling outlet for disabled, chronically ill, and aging people who work in nonprofit fundraising and philanthropy. DiD’s goal is to amplify our expertise on how to put disability inclusion principles into practice, including workers’ rights, by welcoming the untapped expertise already within our sector. I’m also advancing #FundDisAdvocacy, a critique of the comparative lack of advocacy funding for disability human and civil rights in grantmaking. The purpose of all of my work is to redirect philanthropy away from “wealthy abled people helping the unfortunate disabled” and toward “economically diverse disabled people leading the work to dismantle systems of structural ableism.” We have to challenge the entrenched idea that disability — not ableism — is the “natural” cause of poverty, homelessness, and abuse. 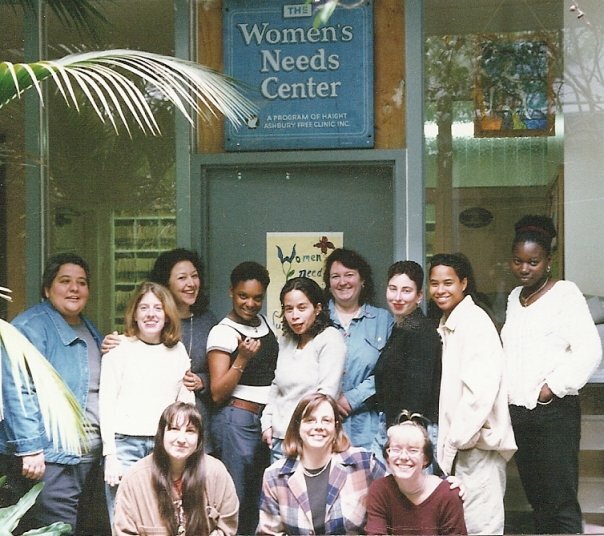 Where I’ve Been: After relocating from DC in 1991 where I had worked as an editorial assistant for the American Geophysical Union and volunteered as a Washington Free Clinic HIV test counselor, I joined the staff of the Women’s Needs Center (WNC) on Haight Street. As one site of the Haight Ashbury Free Clinic (HAFCI), we provided gynecological care, HIV testing, and street outreach services. WNC was where I learned fundraising on the job for 8 years amid deep — and sometimes painful — staff–led work on how to improve our reproductive health services for marginalized women. But it was the experience of confronting how race, class, gender, violence, and poverty issues affect health care that translated my lifetime of disability experience from the purely personal into the political. As a result, I was able to bring disability and chronic illness to the fore as political and economic factors, new concepts for most of my HAFCI colleagues, who had understood disability solely through the medical model. Outside WNC in 1996. 6 years and one ADA-inclusive renovation in our grassroots women clinic gave me — me. I got disability + civil rights, thanks to our women of color, LGBTQ leadership, plus getting to work with Barbara Waxman Fiduccia through her accessible clinic project. I was 33 and Barbara was the first woman with muscular dystrophy I had ever met who — like me — was employed and in a long-term relationship. I owe my admittedly eclectic approach to disability rights activism, fundraising, and leadership to three former bosses, Belma González, the late Barbara Brenner, and Irma Hererra — none of whom identified as disabled while we worked together. I don’t think it’s a coincidence that these three activist leaders — two Chicanx from working-class Texas families, and one queer breast cancer survivor — were my strongest allies as a white disabled woman who’d lived outside any disability community until the age of 33. While working as one of our clinic’s managers, I was admitted into the 1995-96 cohort of the Women’s Health Leadership (WHL) program and completed a year of advocacy training as the only self-identified disabled person in our group of 50 emerging grassroots leaders in California. It was around this time that women began confiding their secrets to me: They had some type of disability or chronic illness that they could never reveal because it was shameful or would risk their reputation for professional competence. This dynamic continues to this day. After finishing the WHL year, I was invited to train and briefly joined the California faculty for Asset-Based Community Development (ABCD), a type of community organizing that centers the knowledge of those inside a community. ABCD’s matter-of-fact practical inclusion of disabled neighbors and criticism of the “care” construct that prevents many disabled people from developing real friendships resonated strongly with me. Following that, I first moved on to Breast Cancer Action, where I was part of the team that developed the Think Before You Pink campaign that critiques cause marketing and urges donors to think critically about what fundraising tactics they support. I then moved to Equal Rights Advocates (ERA) where I first learned about the concept of the ideal worker and saw its potential application to disabled, chronically ill, and aging workers. I’ve also worked for Legal Aid at Work (formerly Legal Aid Society — Employment Law Center), the San Francisco LGBT Community Center, and consulted for the Mental Health Association of San Francisco, Bay Area Legal Aid, YWCA-San Gabriel Valley, Sins Invalid, and the Center for Young Women’s Development. My media advocacy experience involved working in coalition with the Labor Project for Working Families, MomsRising and The Impact Fund, and a stint as DREDF’s Director of Communications. Since 2011, cross–disability advocacy and policy has been my ever–changing but exciting focus at DREDF. Because I grew up resisting the idea that disability = charity, the opportunity to be a social justice fundraiser with a disability is as much about upending stereotypes as it is about resource development. As a crip, I want the members of my traditionally excluded and highly diverse community to be recognized as the contributors we are to a just society. Tales From the Crip features disability cultural and political critique, and commentary. My writing is a mix of the serious, the sardonic, and the sincere that uses personal essay, opinion, spoof and parody forms, and fiction to convey the emotional landscape of lifelong disability and the waxy bummer build-up that comes from ableism. My writing has also appeared in The Progressive , Ragged Edge , off our backs , and other outlets. I was a longtime member of San Francisco’s Writing Circles for Women (1993-2001), attended Flight of the Mind fiction writing workshops in 1997, 1998, and 2000 taught by the novelists Charlotte Watson Sherman, Lynne Sharon Schwartz, and Gish Jen, respectively. In 2002-2003, I completed a fiction mentoring year with Lewis Buzbee through San Antonio’s Gemini Ink. I worked privately with Lewis from 2003-2007 and completed two drafts of a novel currently titled There’s No Cure for Gretchen Lowe. I hold a Bachelors degree in Philosophy from The American University, with a focus on contemporary Continental linguistics that remains a remarkably soothing balm for the painful chapping brought on by today’s utilitarian bioethicists. 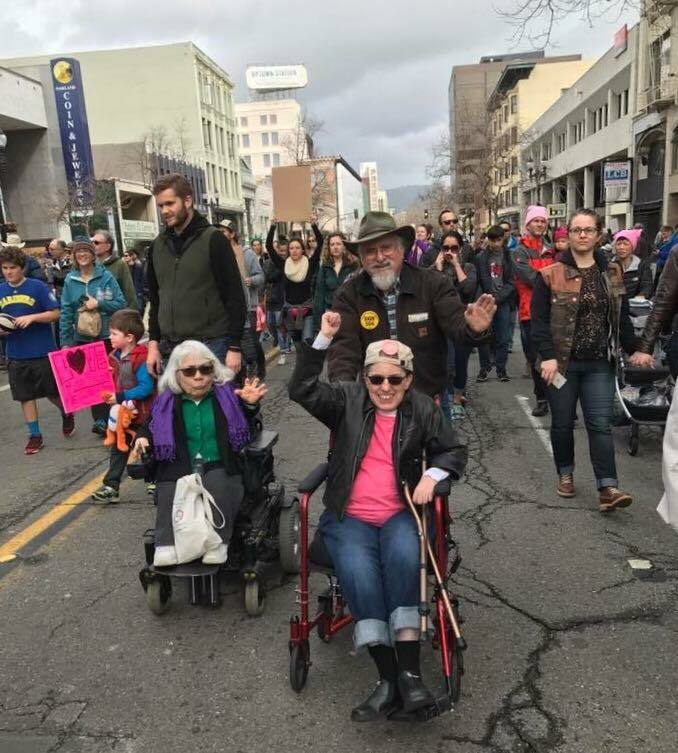 Photo Caption: (adapted from Ken Stein’s): With Ken and Ann Cupolo Freeman on our way to the Oakland 80,000-plus strong Women’s March rally on January 21, 2017. Because we had gotten to 17th and Broadway before the tens of thousands of marchers, we were able to jump right in at the front. Photo by Sarah Dunham.